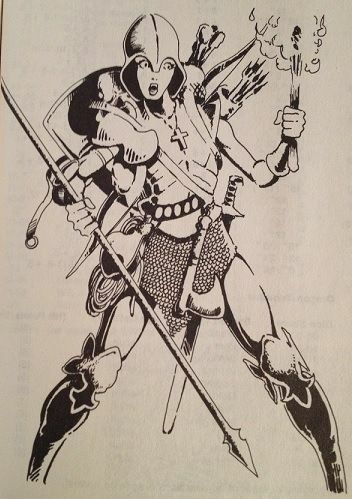 In the 1974 D&D rules, encumbrance was tracked in coins. The PC’s miscellaneous equipment was assumed to always weigh 80 coins. To that, one added armor and weapon weights (in coin equivalents), and the actual number of coins carried to come up with a total, which could be mapped to a movement rate. Ostensibly 10 coins weighed one pound, but you did not need to know this fact to calculate encumbrance. In that system, 3000 coins is the maximum a PC can carry. This is an elegant system, because it did not force the player to track individual equipment weights. I think one of the biggest mistakes later systems and various old school D&D clones made was discarding this system and providing a weight in pounds (or kilograms, stone etc.) for every single bit of equipment. I’ve noted before that tracking encumbrance this way is a fun-sucking exercise, and I have never used it when I run games. Using it as written slows down character creation to a crawl. The system I’ve settled on is an even simpler one, and in the finest old-school tradition is a mix of rules from OD&D, Pits & Perils, and Holmes Basic. A PC can carry a reasonable amount of gear, armor, and weapons, plus 1200 coins – no more. In the original game, strength does not directly affect attack or damage rolls, or give any direct bonuses or penalties at all. What I do is give PCs with a STR of 15 or more an added 600 coin carrying capacity (so 1800 coins). With a STR of six or less, they can carry only 600 coins. 20 coins of any type weigh one pound, but again this fact is not needed to calculate encumbrance. I think this directs the player attention away from miscellaneous equipment weights back to coins, where it should be. After all, when 1GP = 1XP, treasure becomes more important than defeating monsters, and is the end goal of any dungeon or overland expedition – to gain XP and advance levels. But what is “reasonable”? Here we can take a tip from Holmes and have players note on their character sheets where their equipment lives. To do this quickly the character sheet can be sectioned by container – so one heading would be “backpack”, another would be “large sack”, and then maybe “belt”. Then the players just list the items in each section. How does this tie in with movement? In line with the original rules, there are three movement rates, corresponding with armor worn. You can see that magic armor in this system is treated as the next higher category to reflect its lower encumbrance. A character can carry up to their maximum allotted coin weight with no change – but once they hit 1200 coins, they drop 3″ to the next lower rate. So, for example, if Drizzle the M-U has a STR of 9 and carries 1,200 coins, his move rate is 9″ and he can carry no more. To make things even easier, a large sack holds (you guessed it) 1200 coins. Apart from keeping track of coins, which players do anyway, and being aware of armor worn, there is nothing more to do as far as figuring out movement rate. You might also like to figure coin-equivalent weights for other common items of treasure, like gems or jewelry. But it’s not strictly necessary unless your players stumble onto a dragon’s hoard.